> Research Library > McAfee > Why Malicious Cyberactivities Are “The Greatest Transfer of Wealth in Human History"
Cybercrime and cyberespionage cost the world millions and even billions of dollars annually. Add to that loss of confidential data and intellectual property, business disruptions, reputation damage, and the cost of securing networks and systems. 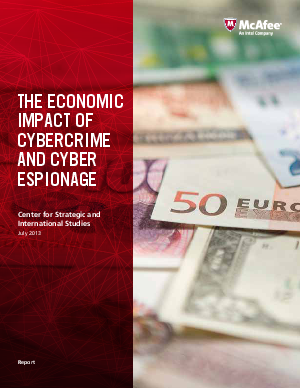 In addition to the financial costs, malicious cyberactivities have larger ramifications on the social fabric of our society, such slowing the pace of innovation, distorting trade, and creating job loss. All of these factors make estimating the cost of cybercrime a big challenge.